Valentine’s Day games can be both fun and educational. This game hits the mark on both counts. With lots of hearts and bears and butterflies, kids keep a close watch on the numbers on their cards waiting for their turn to say, “I have … Who has…?” When you’re done playing, switch up the cards and play again. Great practice for number order, listening skills, speaking skills, and of course the obvious counting to 10 skills. 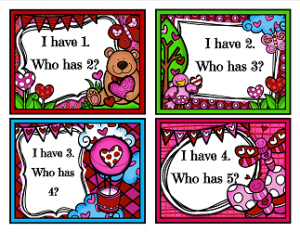 For more counting practice, have the kids count how many hearts or bears or butterflies are on their card. To strengthen their color identification skills, you an have your kids tell you the colors on their card or count how many colors are on their cards.